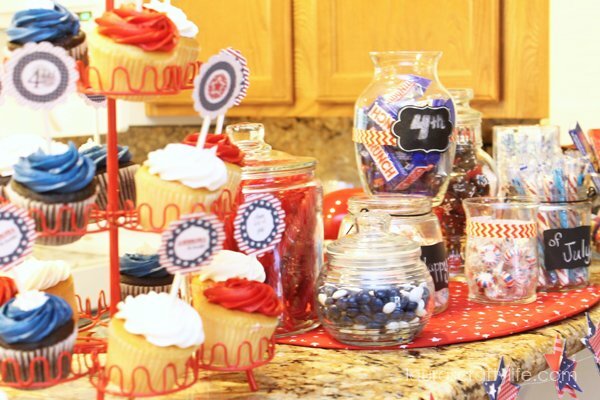 With Labor Day coming up in a less than a week, you may be planning to throw a fun party for family and friends. 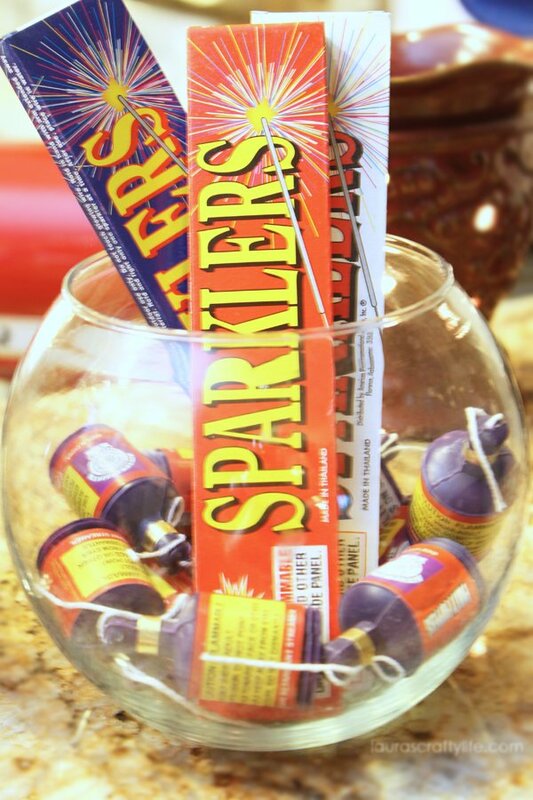 I have some great ideas for you from a party a friend of mine and I threw for the 4th of July. It turned out to be so much fun and we had a great time!. We had so much delicious food and some really fun decorations. 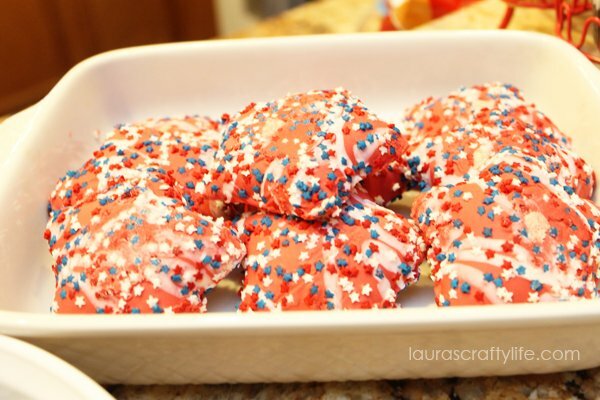 We used my 4th of July printables to decorate the cupcakes. This is a tip you can use for any party. 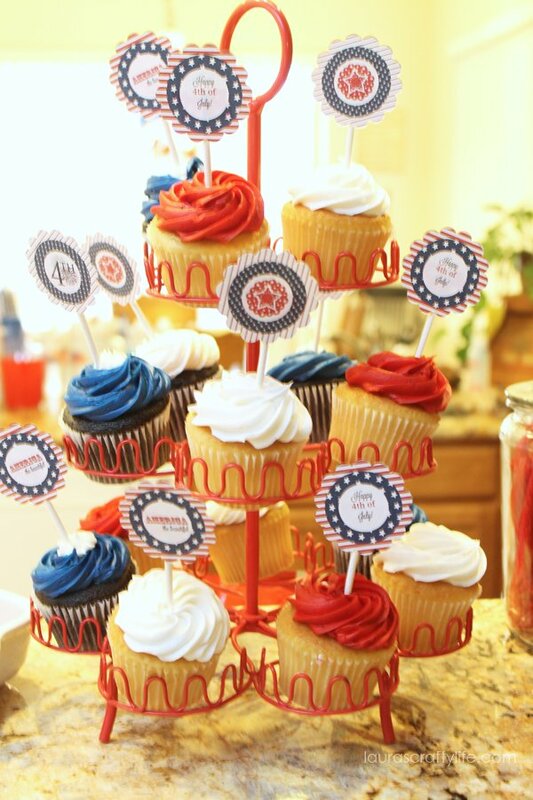 Use cupcake toppers to decorate your store bought cupcakes. 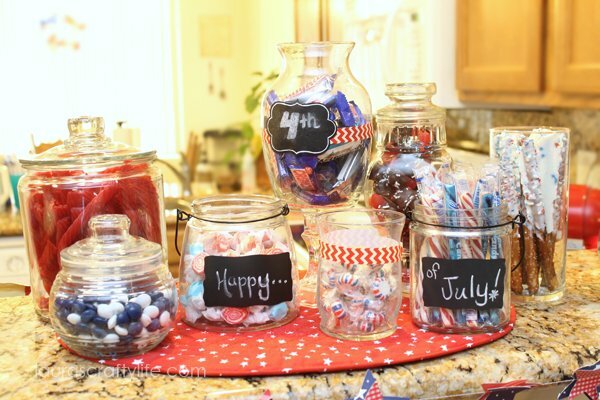 It is an easy, inexpensive way to make your party more personal without a lot of time on your part. 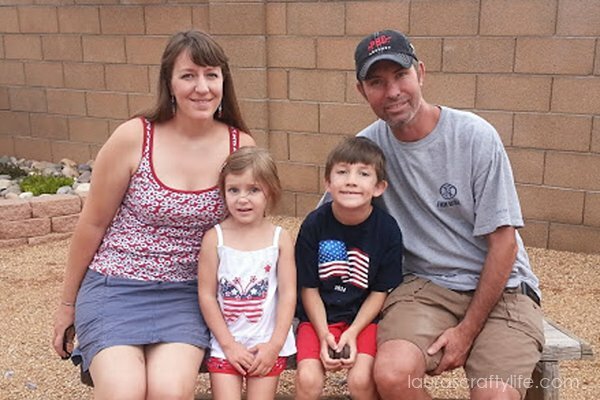 You can download your own 4th of July printables. 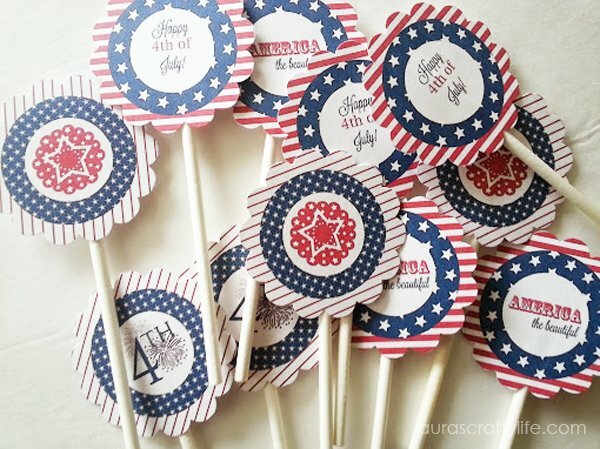 It includes cupcake toppers and straw flags. 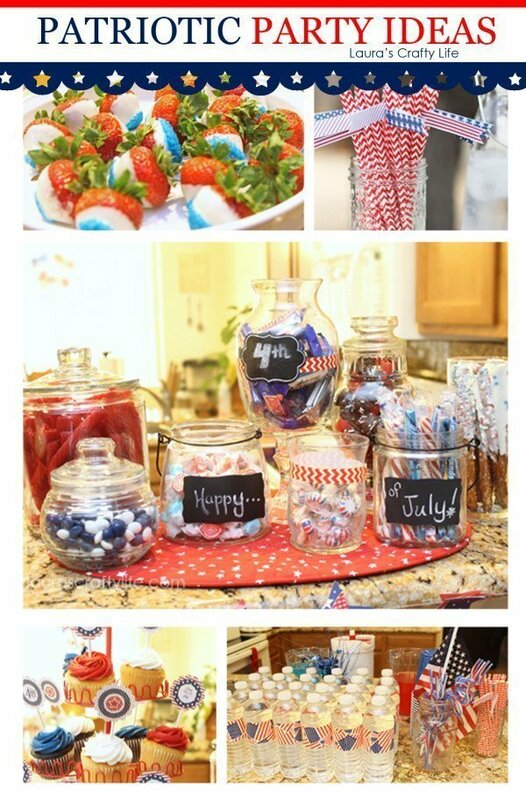 My friend created a fun candy station with all red, white and blue candies and treats. We had twizzlers, crunch bars, chocolate cinnamon bears, York pieces, taffy, mints, candy sticks in red and blue, and chocolate covered pretzels! The kids (and grown ups, too) loved this. 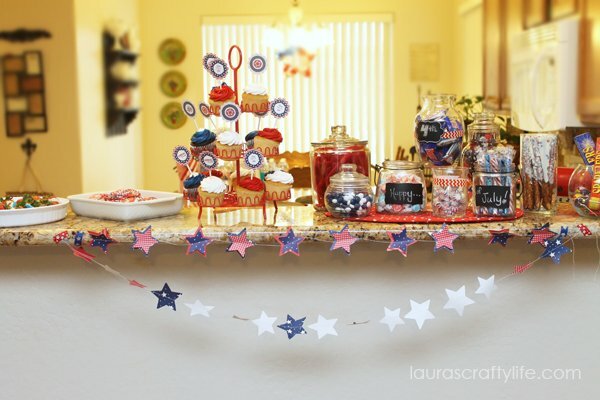 I created a patriotic garland to hang on the kitchen island. I will be sharing later this week how you can make your own. 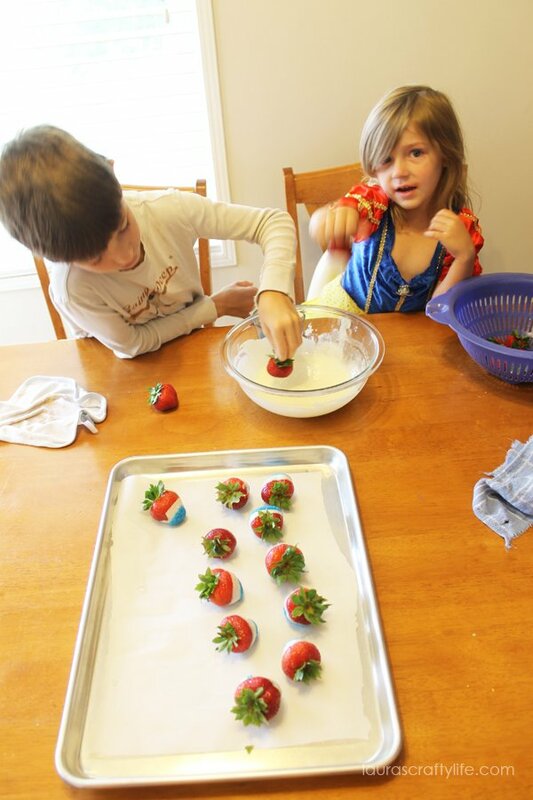 The kids and I made white chocolate dipped strawberries. I am sharing the recipe below. 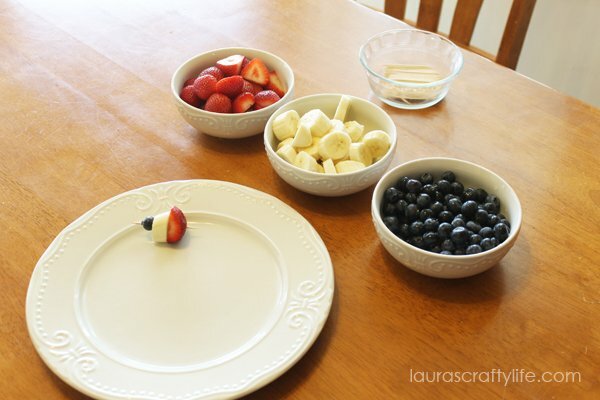 We also made fruit kabobs using strawberries, bananas and blueberries. 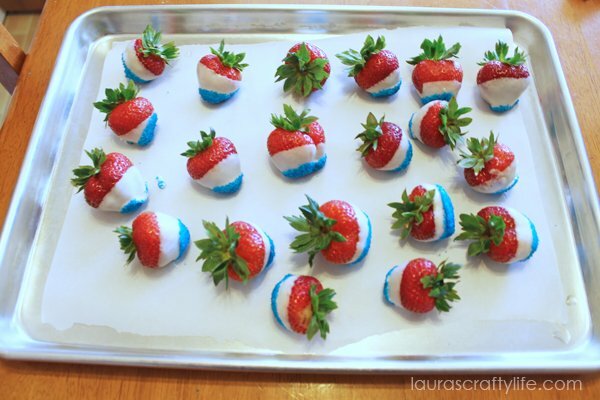 We simply skewered the fruit on toothpicks. To keep the bananas from browning we dipped them in a mixture of one cup water to one tablespoon lemon juice. 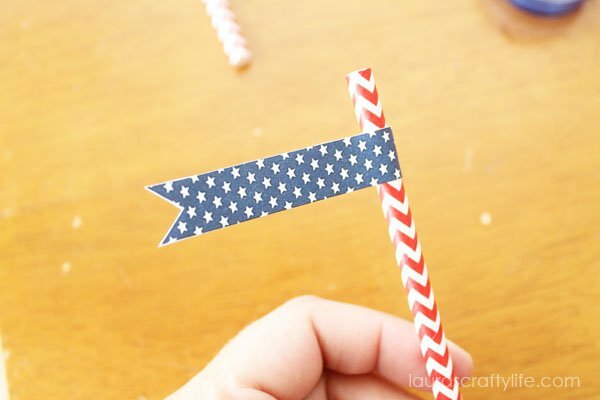 For drinks I used my printable straw toppers to decorate some red chevron straws I purchased from Pick Your Plum (affiliate link). 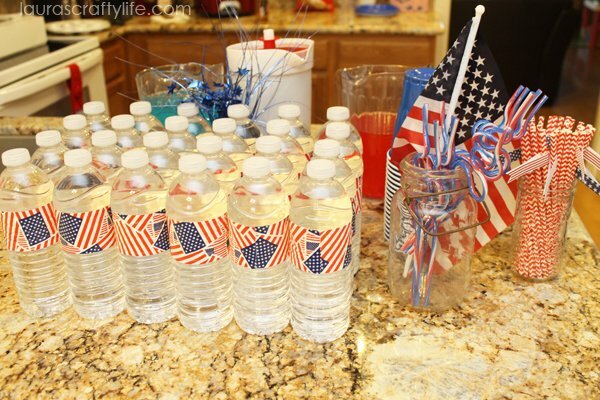 My friend Amy, wrapped water bottles with flag duck tape. Simply remove the original water bottle label and cut a piece of duck tape to wrap around the bottle. 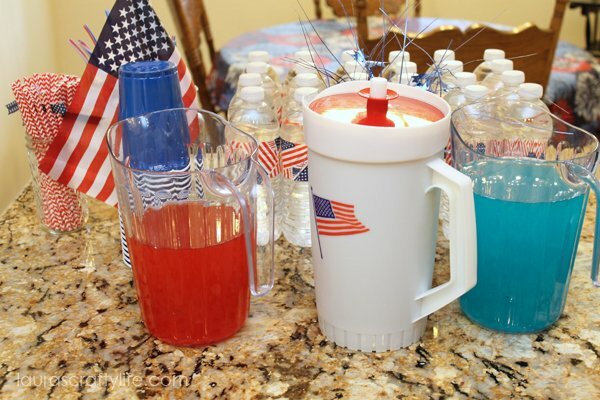 We also had blue and red koolaid for drinks. 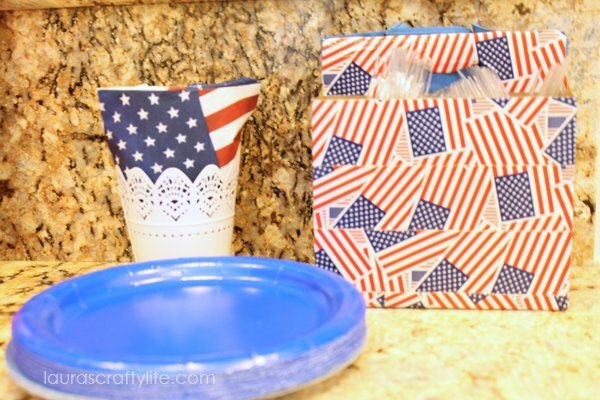 We created a utensil caddy with a cardboard drink holder and more of the flag duck tape. 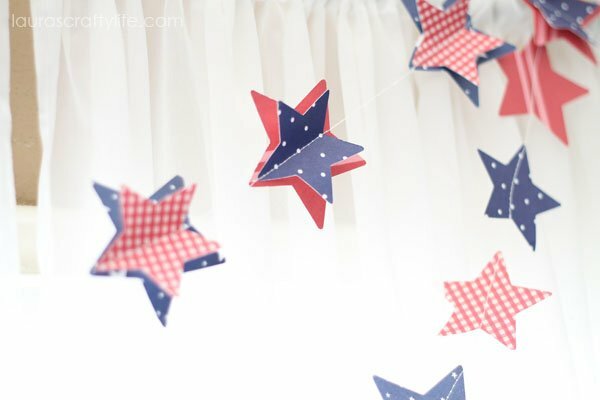 The great thing about having an all-American party is that you can reuse decorations several times per year – Memorial Day, 4th of July, and Labor Day. 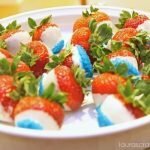 These patriotic strawberries are the perfect treat for your red, white, and blue celebration - 4th of July, Memorial Day, Labor Day. Combine white chocolate and shortening in a microwave safe bowl. Microwave on high for 30 seconds. Stir. Continue microwaving chocolate mixture in 30 second increments, stirring each time, until completely melted. 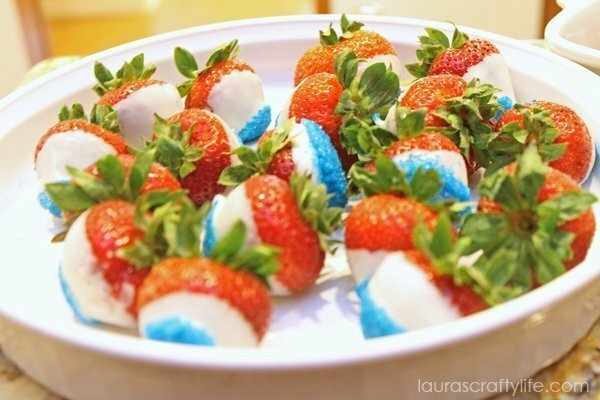 Dip strawberries into melted chocolate mixture and then into sugar crystals. Place on a parchment lined baking sheet and allow to cool.